Beautifully engraved certificate from the Quanah Acme & Pacific Railway Company dated 1912. This historic document has an ornate border around it. This item is hand signed by the Company's President and Assistant Secretary and is over 92 years old. 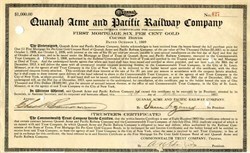 QUANAH, ACME AND PACIFIC RAILWAY. The optimistic tag "and Pacific" was attached repeatedly to the names of western railroads. Only a few of these actually stretched to the Pacific coast or found service areas there. Nevertheless, the tag frequently implied transcontinental aspirations or a desire to connect with lines reaching that broad area. In the case of the Quanah, Acme and Pacific it was a matter of merely wanting to be a part of a transcontinental route. The QA&P started in 1902 as the Acme, Red River and Northern, a local road in Hardeman County designed to serve the needs of the Acme Plaster Company. By 1909, however, Sam Lazarus, owner of the railroad and the plaster plant, perceived that the country south and west of Quanah and Acme was "ready to open" and that profits could be made by expanding the railroad in that direction. Thus the ARR&N perished to become the Quanah, Acme, and Pacific. The QA&P built into Cottle County and then Motley County, claiming that its eventual goal was El Paso and a connection there with the Southern Pacific's famed Sunset Route to Pacific tidewater. The track reached thirty-five miles to Paducah in 1910 and was extended thirty-nine miles to MacBain, a stock-loading point just short of the Caprock, in 1913. In addition, Lazarus and the railroad promoted townsite developments at several locations, the most impressive of which was Roaring Springs. In 1916 the Quanah owned six locomotives, fifty-eight freight cars, two passenger cars, and ten company cars and earned $63,932 in passenger revenue, $241,196 in freight revenue, and $9,522 in other revenue. Stock control of the QA&P passed to the much larger St. Louis and San Francisco Railroad Company (Frisco) shortly after construction began, although the small road retained independent management with Lazarus as president. The Frisco saw the QA&P as a logical extension of its own line, which began in St. Louis and passed through Tulsa and Oklahoma City before reaching the Red River near Quanah. During the mid-1920s West Texas was the scene of many competing railroad proposals. In the end, the QA&P won only the right to extend from MacBain twenty-six miles to Floydada, which was reached in 1928. Two years earlier the road had also acquired eight miles of track from the tiny Motley County Railway, which connected the community of Matador with the QA&P, but this branch was abandoned in 1936. In 1931 the Quanah was listed by the Railroad Commission as a Class II road and owned eight locomotives, forty-seven freight cars, and twenty-seven company cars. Earnings for 1931 included $27,126 in passenger revenue, $449,431 in freight revenue, and $9,980 in other revenue. The Great Depression threatened to kill not only the Matador stub but the QA&P as well. Fortunately, however, the QA&P won important regulatory and legal decisions to participate in transcontinental movements with the Frisco on the east and the Santa Fe on the west. Thus, from the late 1930s until the fall of 1973 impressive through trains passed over QA&P rails. This arrangement ended when the Frisco and the Santa Fe agreed to divert overhead business to another gateway. This decision and the era of big mergers in the railroad industry spelled doom for the QA&P. The line from Floydada to Paducah was abandoned in 1979, and although the remaining trackage remained in service, the Quanah, Acme and Pacific Railway-as a corporate entity-perished shortly after the Frisco became part of the Burlington Northern in 1980. BIBLIOGRAPHY: Donovan L. Hofsommer, "The Acme, Red River & Northern: An Early Texas Short Line Railroad," Red River Valley Historical Review 5 (Fall 1980). Donovan L. Hofsommer, "Town Building on a Texas Short Line: The Quanah, Acme & Pacific Railway, 1900-1929," Arizona and the West 21 (Winter 1979).